"Daoism maintains that the individual should seek only to conform with the underlying pattern of the universe, the Tao (way), which can neither be described in words nor conceived in thought. Through spontaneous compliance with the impulses of one's own essential nature and by emptying oneself of all doctrines and knowledge, one achieves unity with the Tao." Chinese temples, perhaps more then the many cathedrals I visited in Europe and Mexico, work to evoke a sense of awe in the worshiper. Whereas cathedrals are seen only as places in which to worship God, temples are seen as the actual dwelling places of the Gods. 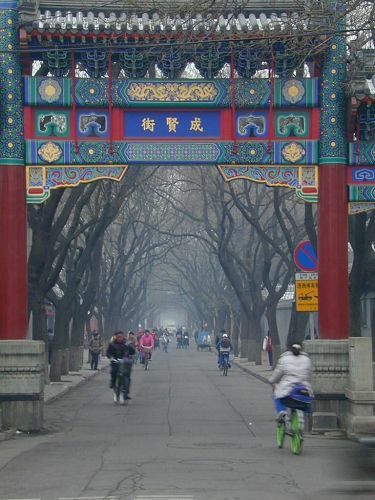 This photo is of a temple in Beijing. 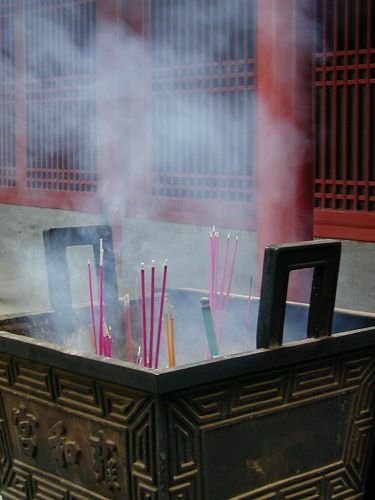 In a Daoist temple, incense is purchased upon entry then burned in special urns as an offering for the Gods. In many Catholic cathedrals, worshipers can purchase candles, which they light as a type of prayer. The church gets funds, the worshiper gets a sense of giving and the burning candles enhance the atmosphere of the church interior. Very similar, the effect of burning incense is perhaps better because everywhere you walk you are greeted with the scent of the offerings. There are many ways to offer prayers in a temple. You can spin prayer wheels, bow on mats, and bang gongs and bells. I like this way of active prayer. The idea is not so much to do this for the God, but to do it for yourself - spinning the wheel should remind you of the endless circle of life. 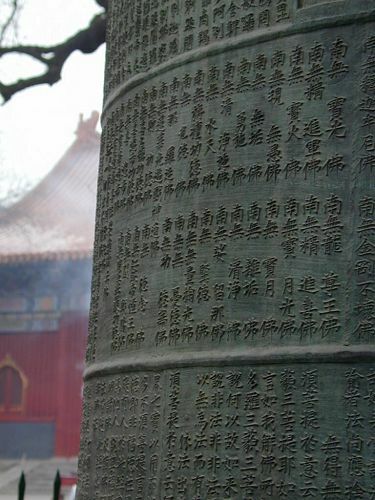 The strike of a bell should jar you into awareness. 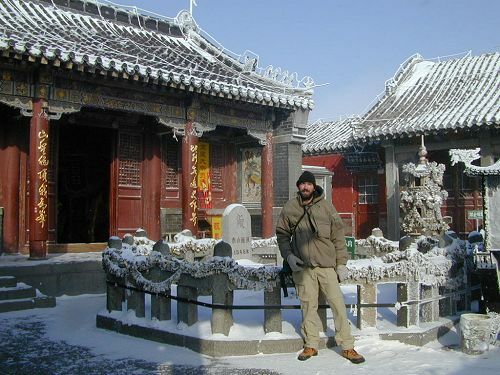 Filled with interest in the Daoist religion, and wanting to complete a vow I made to myself long ago, I traveled south with Craig from Beijing to Tai Shan to climb the holiest of the 5 holy Daoist Mountains in China. The climb is paved with stairs (6,800 of them) and lined with shrines, statues of heroes and gods, and inspirational sayings carved into the rocks. 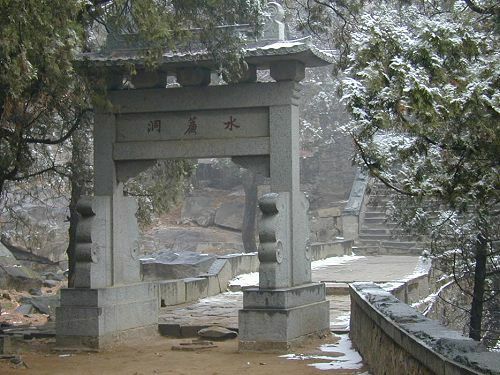 This is a photo of the first gateway up the mountain. On the way to the summit I passed many stands selling walking sticks, soup, postcards, and incense to burn at the many temples along the way. I also passed all sorts of people, from old women leaning heavily on canes to young men employed to carry supplies to the hostels at the top. Everyone I saw gave me a big smile and a thumbs up. I don't think many foreigners climb Tai Shan and I felt privileged to be there. 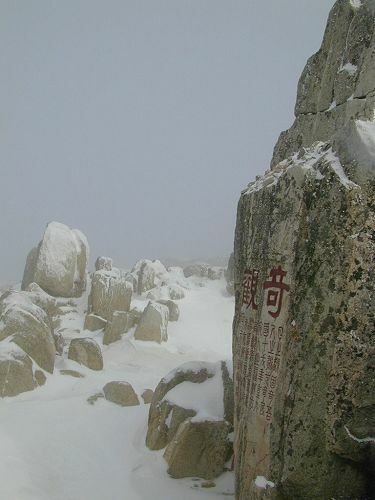 At the summit are a few pilgrim hostels, a couple of soup stands, and several temples. 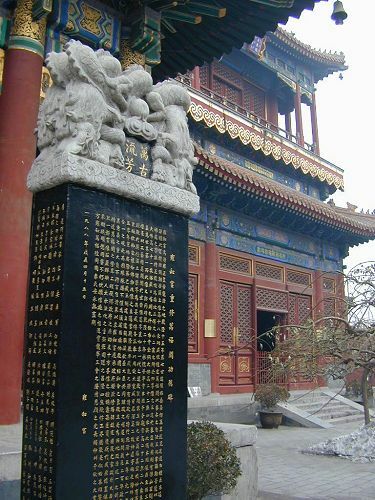 The main temple is the temple of the Azure Cloud Goddess. Many people make the climb during the night, arriving in time to see the sun rise. When I got to the top, the summit was enshrouded in clouds and snow. It was clear above me, but too cloudy to see the surrounding countryside. I snapped the requisite summit shot, wandered through the temples, and then headed down. 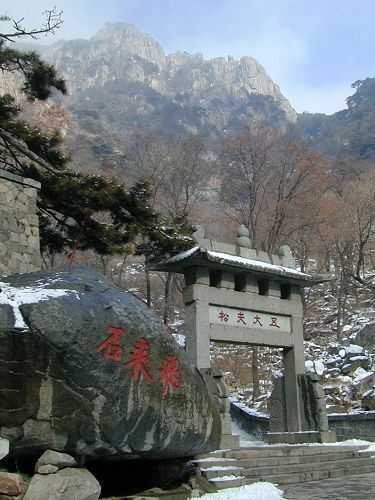 It is said that every devout Daoist should make the pilgrimage and climb Tai Shan once in their lives. The reward, supposedly, is a hundred-year lifespan. I'm not sure I'll achieve that age but as I gasped the thin air at the summit and marveled at the many monuments, I knew that however long I lived, I'd always remember my trip up Tai Shan.